The Moon has been the focus of numerous expeditions and studies. Almost a decade ago, researchers discovered the hydrogen-bearing molecules, water and hydroxyl ion, on the Moon. This discovery was made possible by the collection and analysis of returned lunar samples; however, this resource-intensive method limited the area of the Moon that could be practically sampled. Recently, another group of researchers from Brown University expanded upon this discovery by developing a global map of these hydrogen-bearing molecules, the first of its kind (1). 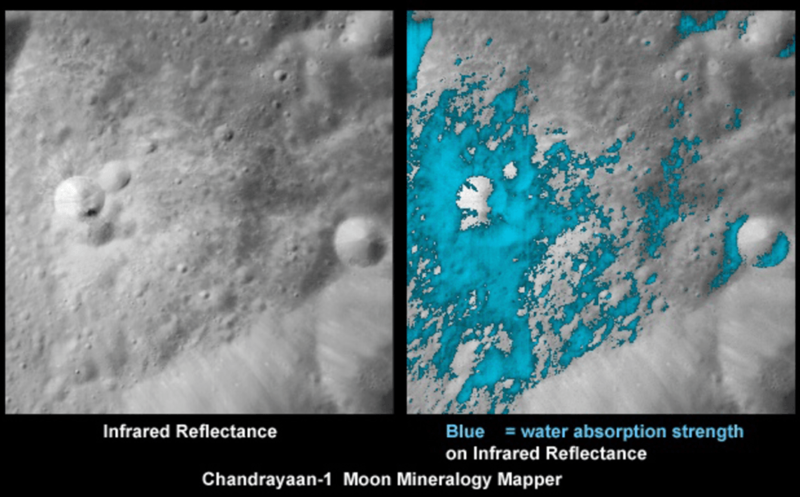 The development of the map required an efficient way to measure relative amounts of water throughout the entire lunar surface; which was made possible by the Visible and Infrared Mapping Spectrometer (VIMS) and Moon Mineralogy Mapper (M^3) located on India’s Chandrayaan-1 lunar probe. VIMS and M^3 work by shooting infrared light onto the lunar surface and then measuring characteristics of the light reflected back. Reflected light with a wavelength between the range of 2.6- 4m is indicative of water and hydroxyl ions on a silicate body, like the Moon (2). The researchers used these data to create maps showing water content and optical maturity, a parameter that relates space weathering to water absorption capabilities. It was previously believed that lunar water is only present on certain areas of the Moon. However, analysis of the VIMS and M^3 data suggests that water is present in almost all regions of the Moon, disproving the original belief. The data also suggests that the amount of water is positively correlated with latitude (2). The most shocking revelation yet seems to be that certain areas of the Moon lose and gain water depending upon the time of day. This fluctuation in water level supports the idea that hydrogen-bearing molecules on the Moon are continually formed and broken apart throughout the day. There are numerous applications for this research, one of which is the possibility of new discoveries. The formation and destruction of hydrogen-bearing on the Moon opens the door to physicists, who can try to explain this process. Because the world continues to make strides in technology that will allow for the colonization of celestial bodies such as the Moon, a global map of water on the lunar surface can be a significant tool. If humans do in fact colonize the Moon, they can choose to occupy areas close to where water is most abundant. One of the researchers, Ralph E. Milliken, stated, “It remains to be seen whether extraction [of this water] could be feasible”, but one wonders about the implications this has during a time when Earth’s limited freshwater resources need to support a rapidly growing population.